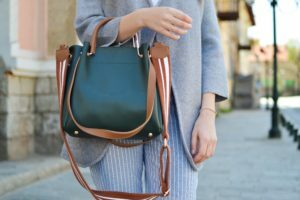 Recently, I’ve been thinking about my favorite purses to bring on vacation. Aside from being convenient, a purse can make or break a vacation. Three things I ask myself when choosing a purse: Will it be comfortable for 8+ hours a day? Is the strap long enough to go across my shoulder and keep my hands free? Does it have zippers or any small obstacles to prevent thieves or pickpockets from taking my valuables? As unfortunate as it sounds, thieves and pickpockets are frequently in tourist areas. Train stations, subways, flea markets, museums, and crowded areas are a thief’s playground. I have only been pickpocketed once, while I was on vacation in Spain. It happened in Las Ramblas, a major pickpocket area in Barcelona. I didn’t realize until much later, but my wallet was gone. I was another tourist casualty, caught off-guard. Ever since that trip, I’m extra vigilant and prefer to wear a cross body bag when I travel. They’re more secure and can be worn in front of you. They keep me hands-free, from airport check-in to any tourist attraction, and I don’t worry where it is. These days, they are the equivalent of a swiss army knife, with many pockets and even small flashlights. I keep my travel guide, iPad mini, snacks, wallet, and a water bottle inside. Having done my fair share of traveling, here are 7 Cross Body bags, I love. Which do you think will work best for you? If you want peace of mind, you can do no wrong by getting a Travelon bag. The fabric and the strap are completely slash-proof, so no one can cut their way inside your purse. It’s strangely more common than you think. At the end of the strap is a large clip key ring, which allows you to unhook it and loop the strap around a chair, or a table for extra security. 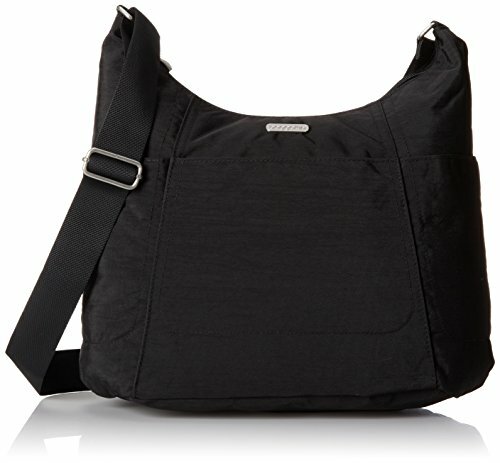 On the outside, it has 2 zippered pockets, to keep belongings out of sight. Inside, a pocket for your passport and credit cards, protects your information from being scanned by a wireless scanning device. An RFID (radio-frequency identification) card, provides complete protection by preventing thieves from remotely “reading” your personal data. Sheesh, it’s hard to keep up with these thieves sometimes, right? 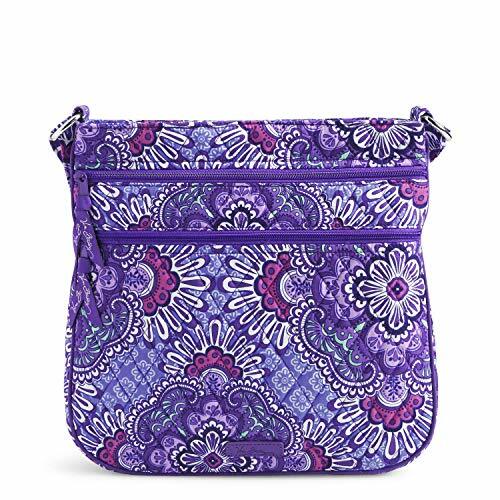 Two additional pockets inside, keep your items neatly organized. To make finding your belongings easy, the inside lining is brightly colored. Inside you’ll also find a neat little LED flashlight, just in case you need to use it at night. I found this bag incredibly light and kept my back ache-free for the length of my trip. If you are a tactile person, the quilted fabric on this bag is lovely to the touch. The zippers on the front, keep items within reach, but also keeps them safe. On the back is an open slip pocket, for your phone or anything you want at your fingertips. It’s slim, but can fit my sunglasses, passport, wallet, and granola bars without any problem. There are a few zippered pockets inside to store your cards or cash. And in case you’re clumsy like me, and spill your drink on it, this bag is washable. I bring a mini travel detergent with me anyway, in the likely event I need to wash something. I don’t know about you, but this bag is a shoe-in for a Kate Spade bag, minus the price. The other colors available are similarly chic. The material is leather and feels well made. The profile is slim, which keeps me from carrying too many things I don’t need. And hoarding 100’s of receipts. It is tidy and keeps me organized, something I am terrible at. Despite its slim size, I am able to put in my cell phone, wallet, and sunglasses. A clean look to satisfy your pristine needs even when dressed down, the Baggallini Gold Sydney. I like durability and style, and this bag delivers on both fronts. The material is durable, waterproof, and also washable. 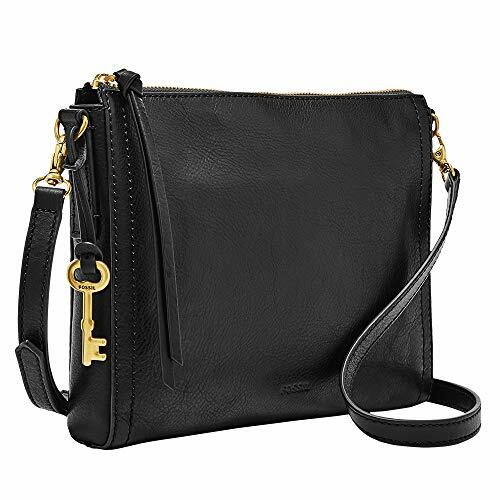 It features gold-tone hardware, interior card slots, zip, and 5 exterior pockets. There are many pretty color options. Inside, the interior is lined in light-colored fabric, which makes it easy to locate items in a snap. It’s deceptively spacious, despite being on the smaller side. Even full, it is light and keeps my back from aching. Some cross body bags don’t sit well over my hip, but this bag hugs me comfortably, if that makes sense. When I want something a little bigger, but still lightweight, this is perfect. A few of my girlfriends have this bag, because it’s so versatile. It’s big enough for my travel books, lunch, and a few items of shopping, while I’m out and about. It has taken its fair share of knocks and spills, but the sturdy material keeps the bag looking fresh. There are 4 slip pockets on the outside and you can easily fit a water bottle in one of them. I like to keep my phone in the back pocket, closest to me, for easy access. 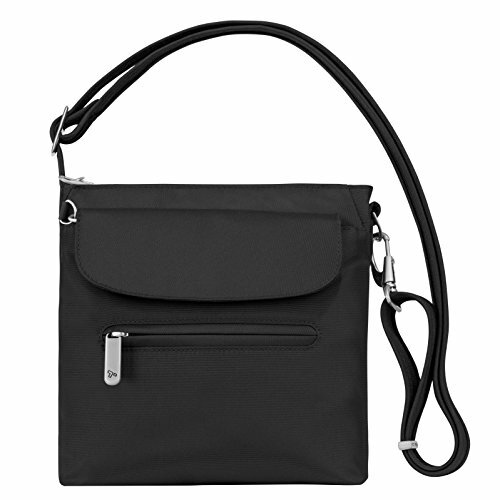 It comes with a removable wristlet, which is great for small change or when you go down for breakfast at your hotel. I can’t be fussed with bringing my purse to breakfast, but a small wristlet is convenient in the morning. I haven’t even mentioned my favorite feature. If you open one of the zippers, it allows the handle of your luggage, to slide through. It’s very convenient, when you’re trying to navigate a busy airport. A friend of mine brought this to Disneyland and it made it through water rides, long lines, with no problem. The waterproof fabric is great if you’re going on a lake or somewhere you might get wet. 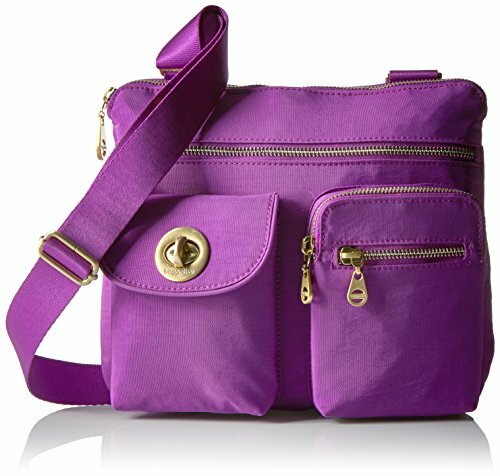 Because it’s a medium sized-bag, you can fit a water bottle and most of your personal items. There is space for shopping, if you find any gifts while you’re out and about. 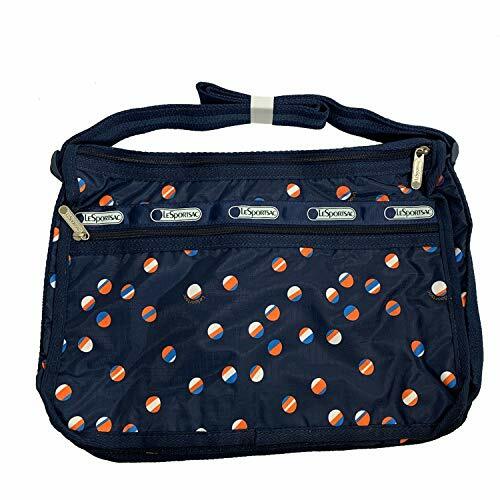 Zippered pockets outside and inside, keep belongings organized. 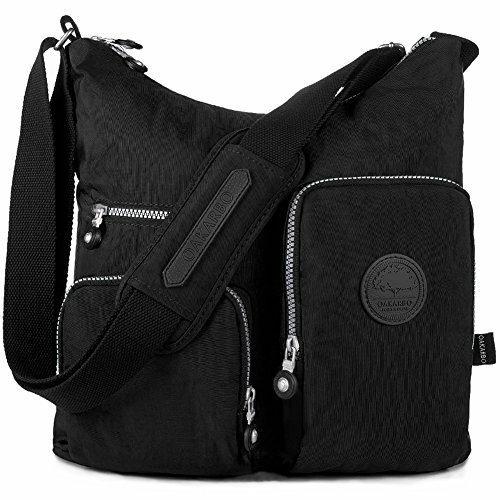 It weighs almost nothing and the shoulder strap makes this easy to carry for 8+ hours. Purse trends come and go, but LeSportsac remains a classic for a reason. Its simple shape and lightweight fabric, makes this a hit with all ages. Typical for LeSportsac, this bag comes in many fun patterns. This pattern in particular says “Summer” to me. On the outside there are 2 large zippered pockets. Inside there are 2 pockets. It comes with a small bag, to keep your cards, loose change, or makeup. It is very spacious and great if you like to bring everything with you when you leave your hotel. Some people like to be prepared and this is a great bag for those people. After many hours of walking, this bag was comfortable. Unless you pack a bowling ball, you should be alright. P.S. Here are my favorite women’s anti-theft wallets with RFID protection.